CAD Forum - How to convert a point cloud to an editable 3D CAD model (mesh)? The application Autodesk Recap provides advanced tools for processing and indexing of large point clouds, e.g. from 3D laser scanning (LIDAR). All current versions of Autodesk CAD software (release 2014 and later) can directly work with these indexed point cloud files. But in some situations you will need to have a real 3D model (even inaccurate as for details) of the scanned object instead of just a point cloud. Remember to use the top command bar to switch to the 3D mesh model. 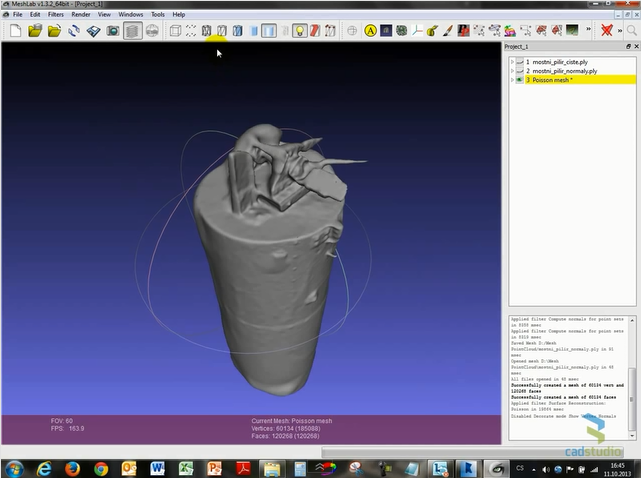 The resulting 3D model can be then saved to a DXF format that can be loaded into any standard 3D CAD application. In some cases, you can also use the free application "Point Cloud Feature Exctraction" available on Autodesk Exchange Apps. It allows to create AutoCAD geometry - polylines, arcs, splines, cylinders, spheres, anuloids - from point clouds. Tip 12184: Overview of CAD formats supported in Inventor 2020 (import/export/AnyCAD). Tip 11939: How to extract pipe centerlines from 3D point clouds? Tip 10804: What features are not available in the 32-bit version of AutoCAD 2017 and 2016? Tip 10324: Commenting models in A360 Team. Selected tip: Simply create points or polyline from coordinates in Excel. Automatically set the Author property in DWG files. « | » Hardware acceleration setting not saved, defaults to OFF.